Zoë Martin-Doike, from Honolulu, Hawaii is a versatile artist who enjoys a variety of musical roles. Passionate about chamber music, Ms. Martin-Doike was a founding member of the Aizuri Quartet, which was a prizewinner at the 2015 Wigmore Hall International Quartet Competition and was selected as the Ernst Stiefel String Quartet in Residence at the Caramoor Centre for Music and the Arts. Last summer, she attended the Steans Music Institute at Ravinia and looks forward to participating in their East Coast tour this spring with director Miriam Fried. This summer, Ms. Martin-Doike will attend the Marlboro Music Festival. 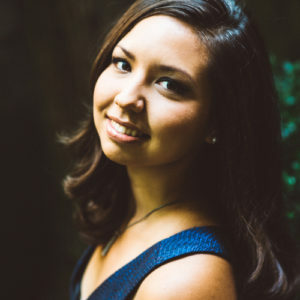 She received her bachelor’s degree from the Curtis Institute of Music where she studied with Pamela Frank and Steven Tenenbom, and is currently pursuing a master’s degree at the Jacobs School of Music at Indiana University, where she is double majoring in violin and viola under the tutelage of Mimi Zweig and Atar Arad.